An essential nutrient, all plants must have boron for normal, healthy growth. Because plants only require it in small quantities, it's categorized as a micronutrient. But boron is just as critical as nitrogen and other elements that plants need in larger amounts. Some vegetables prefer more of this micronutrient than other plants require, but adding boron to your vegetable garden demands great care. The range where boron helps plant growth is narrow. Too little boron causes poor vegetable production, but even slightly too much of this common element can leave soil toxic to all plant life. Beets thrive with more boron than many other vegetables tolerate. Boron affects many aspects of plant growth, but it especially impacts fruit set and ultimate yields on vegetable crops. The element influences how vegetables process carbohydrates and move the sugars that control fruit taste, quality and color. Boron-deficient vegetables experience a breakdown of their growing points, which leaves plants stunted or deformed. Misshapen flowers inhibit good pollination and reduce fruit set and quality. Poor root growth inhibits the uptake of other essential nutrients. New growth on boron-deficient vegetables may be curled and thick or have a yellow or red tinge. Severely deficient plants fail to produce any seeds or fruit at all. Vegetables differ considerably in their response to boron. Some types flourish with very little, while others show severe deficiencies at the same levels. Cauliflower and broccoli (both Brassica oleracea var. botrytis), turnips (Brassica rapa) and beets (Beta vulgaris) produce best with more boron than peas (Pisum sativum), cucumbers (Cucumis sativus) and peppers (Capsicum spp. ), which need very little. Carrots (Daucus carota spp. sativa), lettuce (Lactuca sativa var. capitata), tomatoes (Lycopersicon esculentum) and radishes (Raphanus sativus) need only moderate amounts. Boron-deficient cabbage-family crops often develop hollow stems. 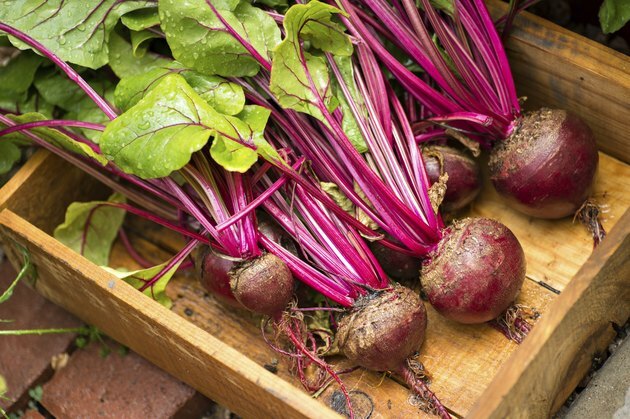 Beets develop soft, dead spots in their centers. Even without visible symptoms, boron shortages can reduce harvests significantly. Always test your soil for boron levels before adding any type of boron product -- even common household forms. The difference between too little boron and toxic levels is small. The amount needed depends on soil type, soil pH, available soil boron, organic matter and the vegetables you desire to grow. Boron is most available in soil pH between 5 and 7. Standard soil tests may not include boron, so send samples to a soil testing laboratory for a specific test if you suspect boron levels are off. Reputable labs will tailor results to your goals. Boron is highly soluble, and it easily moves through moist soil. Deficiencies often occur in high-rainfall or high-irrigation areas or in sandy soils. Toxicities occur most often in in areas with low rainfall. When boron is lacking, many products meet the need. From boron-based household products to commercial boron additives, the amount of actual boron in these products may range from 11 to 20 percent. Follow the test result recommendations precisely. Soil and Plant Laboratory, Inc. advises that boron can be toxic to some plants at levels near only 1 part per million. The actual boron needed to correct common soil deficiencies is as low as 1/2 to 1 ounce per 1,000 square feet. Apply the recommended boron to the soil, and water the area to move boron into the root zone. Wear protective clothing, including safety eyewear, and wash well with soap and water after applying the boron. What Is an Acid Fertilizer?